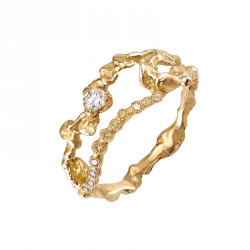 This handcrafted ring is 18 karat yellow gold app. 5grm, it has an elegant open design set with a Akoya pearl. 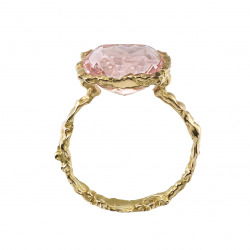 This handcrafted ring is 18 karat yellow gold app. 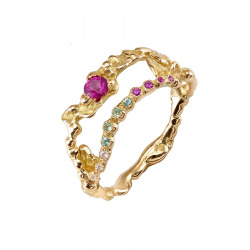 5grm, it has an elegant open design set with pink tourmalines, pink sapphires and a Akoya pearl. 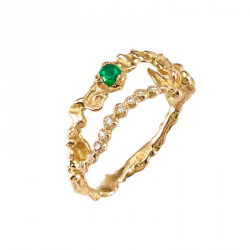 This handcrafted ring is 18 karat yellow gold app. 3grm, it is set with a Akoya pearl and fresh water pearls. 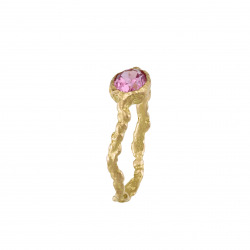 This handcrafted ring is 18 karat yellow gold app. 3 grm, it is set with rubies, pink sapphires and a Akoya pearl and fresh water pearls. This ring is 18 karat yellow gold app. 3grm. It is set with pink fresh water pearls 10-11mm, and diamonds app. 0.034ct. This ring is 18 karat yellow gold app. 3grm. It is set with Tahiti pearls 10-11mm,and rubies. This ring is 18 karat yellow gold app. 3,1 grm. It is set with white fresh water pearls 10-11mm, and rubies. 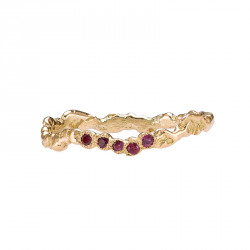 This ring is handmade in 18K yellow gold. It is set with a intense pink sapphire, approx. 0.3 ct. The ring band is a chain which is moveable in order for it to position its self nicely on the finger for a real comfort. Its weight is 1 g approx. This ring is 18 karat yellow gold app. 2grm. It is chiseled with irregular motifs. It is set with orange sapphires. Each ring is unique. Its delicate band feels weightless and is perfect for stacking. This ring is 18 karat yellow gold app. 3,5grm. It is chiseled and assembled with asymmetric arabesque patterns. It is set with a ruby app. 0,04ct, paraiba tourmalines app. 0,02ct, rubies and diamonds app. 0,01ct. This ring is 18 karat yellow gold app. 3,5grm. It is chiseled and assembled with asymmetric arabesque patterns. It is set with a white diamonds app. 0,11ct, grey diamonds app. 0,04ct and yellow diamonds app. 0,03ct. This ring is 18 karat yellow gold app. 3,5grm. It is chiseled and assembled with asymmetric arabesque patterns. It is set with a emerald and diamonds. This ring is 18 karat yellow gold app. 3,5grm.It is chiseled and assembled with asymmetric arabesque patterns. It is set with a ruby app. 0,02ct and diamonds. This ring is 18 karat yellow gold app. 3,5grm. It is chiseled and assembled with asymmetrical arabesque motifs. It is set with a diamond and paraiba tourmalines. This ring is 18 karat yellow gold app. 3,5grm. It is chiseled and assembled with asymmetric arabesque patterns. It is set with a pink sapphire and tsavorites. This handcrafted ring is 18 karat white gold app. 5grm, set with pink sapphires app. 0,10ct.